Music fans are excitedly awaiting the 52nd GRAMMY Awards, broadcast on CBS, Sunday night, January 31st. Six albums are up for the Best Musical Album For Children award. According to Zooglobble blog, these awards will be handed out on Sunday afternoon and you can watch live streaming video at GRAMMY Live. (No prime-time coverage for these children's media awards, the way it sounds.) We're excited to find out which albums will receive a GRAMMY. The kids and I recently had the chance to listen to American Heroes #3 by Jonathan Sprout. This album by singer-songwriter Jonathan Sprout is the third in an educational series of biographical songs highlighting famous Americans. In American Heroes #3, Sprout focuses on the 10 following remarkable individuals: Milton Hershey, John Muir, Elizabeth Blackwell, Jonas Salk, Jane Addams, George Washington Carver, Wilma Rudolph, Thomas Jefferson, Pocahontas and Cesar Chavez. The CD, released in 2009, has won eight awards and a GRAMMY Nomination. When I was in eighth grade, my history teacher taught us about the War of 1812 and played a recording of the song, "The Battle of New Orleans." Now I don't remember too many of my history lessons, but I do clearly recall listening to the song in class and thinking it was a fun, catchy and interesting way to learn about history. (The song was originally written by Jimmy Driftwood to teach history to his high school students and Johnny Horton's version hit number one on the charts in 1959.) I can still recite the lyrics to this day, so I am living proof that using music as a device for learning works. Sprout's songs teach children American history in the same way - through music. He incorporates various musical styles from pop to gospel into his songs and often uses backup singers to highlight key chorus phrases. Sprout's album differs stylistically from other children's albums. His story-songs have an adult contemporary sound. While I'm not sure if this is something parents would normally pop in the player for repetitive play, the album is an excellent supplement for home history studies and useful tool for teachers in school classrooms. The detailed illustration on the cover shows all the female and male American heroes featured in the album, with a particularly large inset of one of my favorite naturalists, John Muir, "the father of our national parks" (though I wish Sprout would have mentioned Muir's Wisconsin roots in his brief biographical note that accompanies the song "Come Back Home"). The album insert provides brief biographies of each of the heroes. Not surprisingly my daughter took a particular liking to "Chocolate King," a song about Milton Hershey. She likes her chocolate and there's a lot to like about the man himself. He gave away his entire fortune to a school for orphans, and Sprout chose to highlight this act of philanthropy in his "Chocolate King" song. "Peanut Man," the song about George Washington Carver has a catchy refrain, Hey, Mr. Peanut Man. Many schools across the U.S. have been named for César Chávez, so I was especially interested to listen to "Si Se Puede!" (Yes We Can), a song about the legendary labor leader from California. 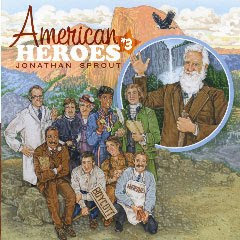 Jonathan Sprout brings history alive in an entertaining and memorable way with this educational American Heroes album. Ahh, so much good music out there for kids - why would anyone put on the Wiggles? I'm glad to see Ziggy marley won, although I love Cathy and Marcy.